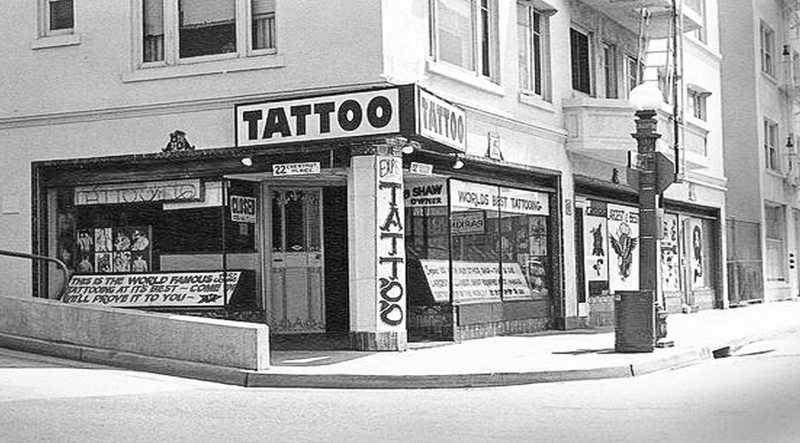 Bert Grimm’s tattoo shop, now Outer Limits, was often a hangout for denizens of The Jungle in Downtown, just west of this shop. Courtesy of USC Archives. 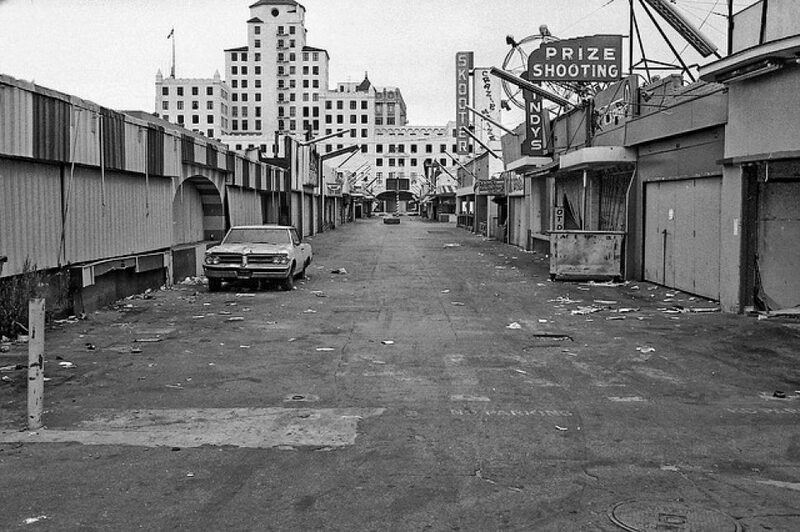 Our ongoing series, Long Beach Lost, was launched to examine buildings, places and things that have either been demolished, are set to be demolished, or are in motion to possibly be demolished—or were never even in existence. This is not a preservationist series but rather a historical series that will help keep a record of our architectural, cultural and spatial history. To keep up with previous postings, click here. In 1963, 18-year-old self-appointed savior Jeri Nunn had annulled her marriage, lost an unborn child, and had a contract on her head: $500 for the person who would assassinate her. So she volunteered as an informant for the LBPD, ultimately leading to the arrest of 14 men and four women—and once her disguise was uncovered during the trial of one of those arrested, her life was perpetually threatened. Her story was part of Long Beach’s head crime reporter Bill Hunter’s five-part series of articles on The Jungle for the Press-Telegram. He described it as a place of “immorality and sexual deviation” that was “beyond the control” of the Long Beach Police Department. The Pike’s demise followed that of The Jungle, located just west of where this photo was taken in the late 1970s. Courtesy of USC Archives. 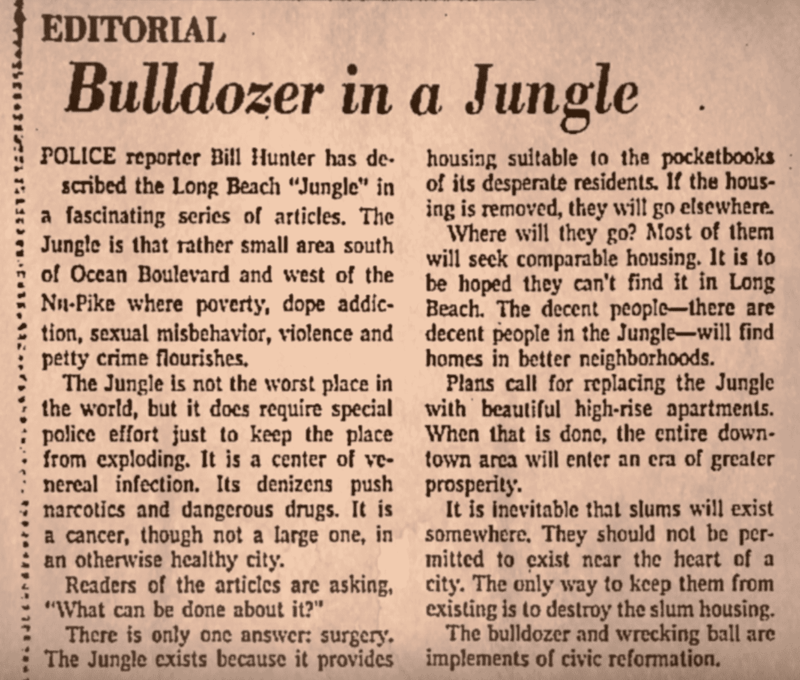 One of Long Beach journalist Bill Hunter’s many pieces on The Jungle. Hunter’s series of articles prompted an editorial from the paper, noting that it was a place where “poverty, dope addiction, sexual misbehaviors, violence, and petty crime” flourish. It’s not the worst place in the world but it does require special police effort just to keep the place from exploding. It is a center of venereal disease. Its denizens push narcotics and dangerous drugs. It is a cancer, though not a large one, in an otherwise healthy city. There is only one answer: surgery. The Jungle exists because it provides housing suitable to the pocketbooks of its desperate residents. If the housing is removed, they will go elsewhere. Where will they go? Most of them will seek comparable housing. It is to be hoped that they can’t find it in Long Beach. The decent people—there are decent people in The Jungle—will find homes in better neighborhoods. 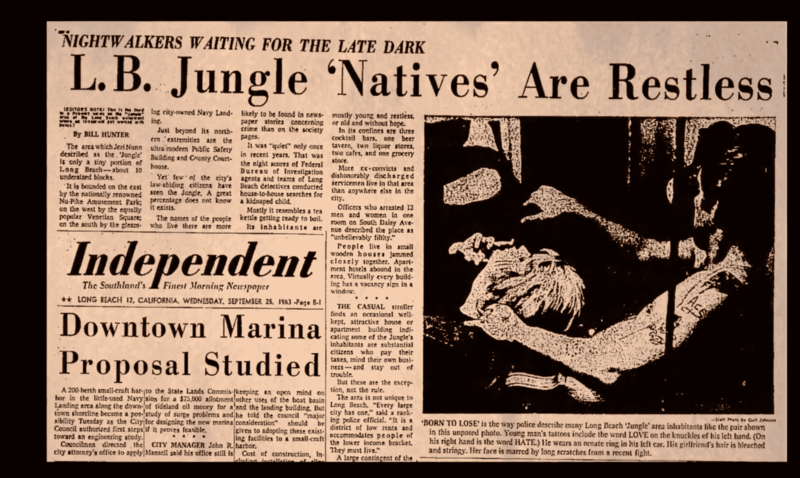 In 1963 alone, the Long Beach Police Department arrested at least two people every day in The Jungle, with some 200-plus crimes occurring in the first half of the year alone. A postcard depicts what The Jungle was like before it became The Jungle: A beach resort. Courtesy of the USC Archives. This wasn’t always the case with The Jungle (or the eventual downtrodden Pike). It was, initially, a resort space where folks came to enjoy the sand and sun. Post-World War II, with the influx of sailors due to the Navy presence in Downtown, things began to change, with sailors seeking thrills to get their rocks off. 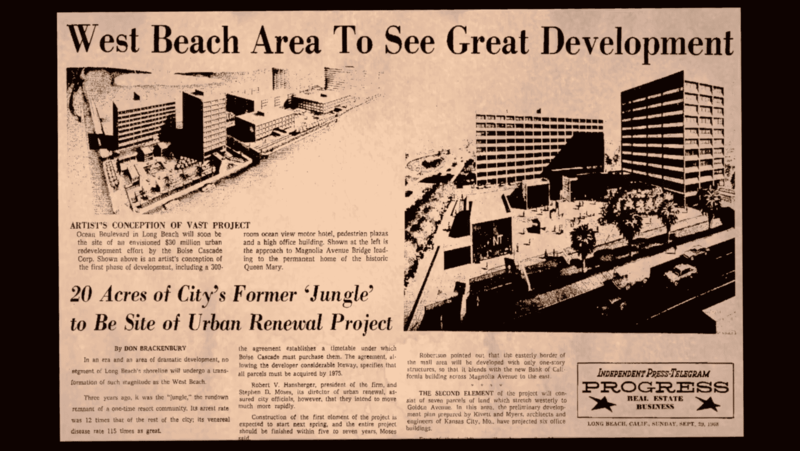 By 1961, when Long Beach’s Redevelopment Agency was formed, its first order of business, as journalist Matt Cohn noted, was The Jungle. 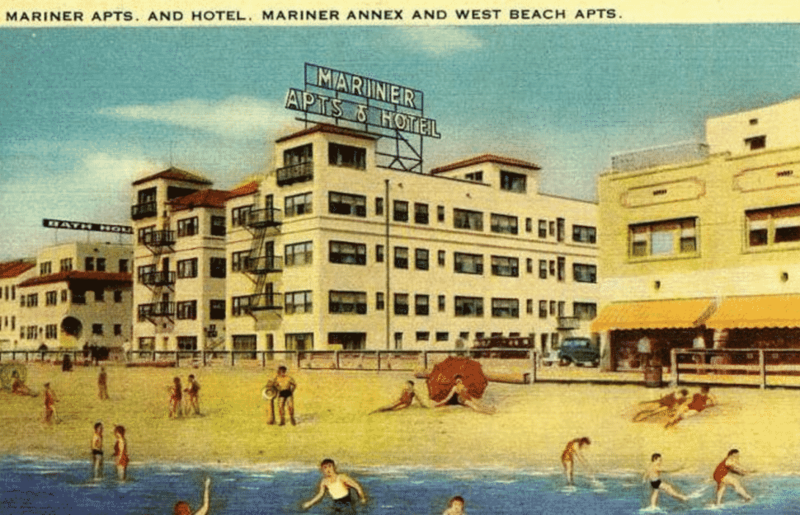 Soon, articles began to sing praises of “the development on West Beach” that would be coming—and they were eventually right. Now, the area is home to precisely what Hunter and others were hoping for: Gleaming office towers, maintained properties and an almost complete lack of crime if not an equal amount of sterility and banality. But one can’t help but give props and recognition to the down-and-outs, the dirty tricksters, the hookers and their patrons, the tatted hot messes that were so virulent and dedicated to the many pleasures of the underbelly that they created their very own wild, unpredictable jungle.